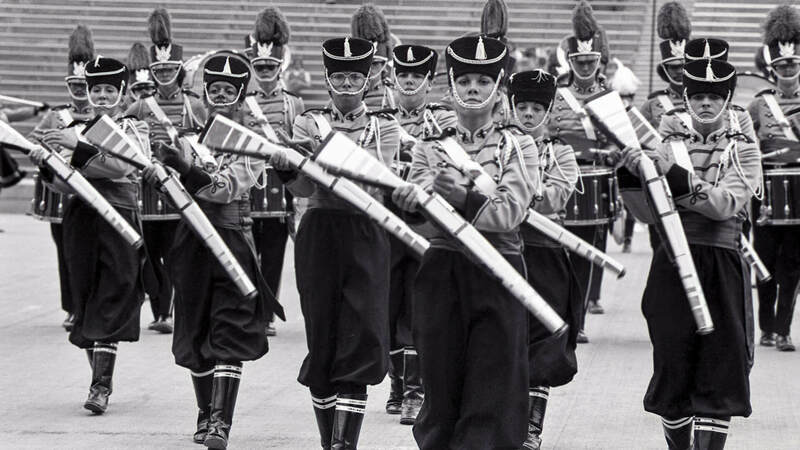 The 1977 Drum Corps International World Championships was the first of two consecutive years the final event of the season was held at Mile High Stadium in Denver. Due to a tie for 12th place in the Prelims competition between the Garfield Cadets and Kilties, 13 corps performed in the Finals. That competition took place on a Friday night as the American Legion, which was holding its national convention in Denver, had previously reserved the stadium for its own drum and bugle corps championship on Saturday. Crossmen earned a spot as a finalist for the first time, and the Blue Devils repeated as Champion with a total general effect mark on the judges’ sheets just a tenth shy of a perfect score. The Capital Freelancers tied the Seneca Optimists for eighth place during the Finals. The corps, which would shorten its name to Freelancers in 1980, had first placed as a finalist in 1976, the second year the California corps attended the DCI World Championships. At the intro to the march, a contingent of 10 color guard members, wearing Russian hats and fluffy Cossack trousers, brandished large scimitar swords as they advanced down the 50-yard line. Up front, they held a mock sword fight, sharing the stage with the corps’ 11-person snare drum line, the largest on the field in the Finals competition. 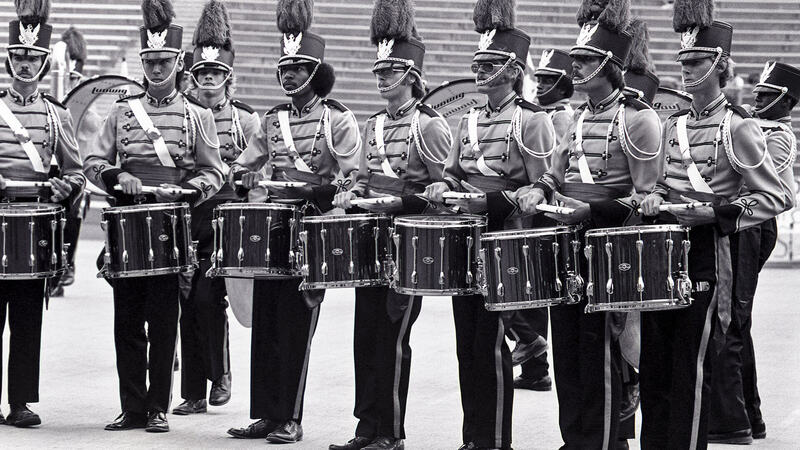 By contrast, two finalist lines marched with only six snare drummers in 1977, with the average number for all remaining corps just over eight. The corps’ percussion feature “Toccata,” was a tune originally co-written by the three members of the progressive rock band Emerson, Lake and Palmer for their 1973 studio album, “Brain Salad Surgery.” The piece was based on the fourth movement of Argentine composer Alberto Ginestera’s “1st Piano Concerto,” which appealed to the classically influenced members of the band. At the conclusion of the piece, the color guard members performed a sort of “Rockford File” routine with flags and rifles spun and tossed in sequence. But unlike the maneuver made famous by the Phantom Regiment, the Freelancers’ “spin” on the sequential was to execute it in two circles behind the drum line. Next came Johnny Richards’ “Adventures in Time,” a suite written for the Stan Kenton Orchestra’s 1962 recording of the same name. Richards wrote the suite for a large 14-piece horn section that included four mellophoniums, a C.G. Conn Company instrument created in 1957 that was akin to a bell-front French horn. The corps performed “Left Bank Express” as its standstill concert production from Maynard Ferguson’s “Life at Jimmy’s” album of 1974. The nimble valve work of the brass line and three featured high note-playing sopranoists, demonstrated they could throw down the notes with the best of corps. Freelancers closed out the production with Chuck Mangione’s “Bellavia,” recorded for the 1975 studio album of the same name. The title is Italian for “beautiful way” and was also the nickname and maiden name of Mangione’s mother. Not so subtle was the climax of the work that spread the corps’ brass line out between the football field’s 15-yard lines.